Live Casino Hold’em poker is a variant of poker that is in very many ways similar to casino Texas Hold’em. However Casino Hold’em can be distinguished from Casino Texas Hold’em by the way it is played, i.e Casino Hold’em is played against the house instead of other players. Advancements in technology have improved the way people enjoy poker games and this variant of the world-renowned games has not been left behind. An almost limitless number of players can join any Live Casino Hold’em poker table and experience the action-packed gameplay that features real dealers, real cards as well as the opportunity to interact with the dealer and other players in real time. The goal of Casino Hold’em, just like in Texas Hold’em, is to beat the dealer’s hand by getting the best possible five-card hand that consists of a combination of the two cards the dealer deals the player and five other community cards. The game kicks off when the players place chips on the ‘ante’ section of the table before the cards are dealt. The players and the dealer are each dealt two cards after this with players only being able to see their own cards and not the dealer’s. Three community cards are then dealt to the table. In case you make an optional side bet at this point, you get to win if you are able to make an ace or better using two cards and the three community cards. Once the side bet is settled you will need to decide to either fold your hand or lose the ante or to keep playing. If you choose to keep playing you will have to make a call bet that is twice the stake of your original ante. Two more community cards will also be awarded to you if you decide to make the call bet. This is the point at which you have to create the best five card poker hand available. The Casino Texas Hold’em game kicks off with all players placing Ante or initial bets. There is also an optional Progressive Jackpot side bet. The dealer then deals each player two hole cards. The house/dealer is also dealt two hole cards. Also, three community cards are dealt face up on the table. Folding or calling are the only two options players have at this point. If a player decides to fold, then they give up their cards as well as their Ante bets. If a player decides to call, the call bet has to be equal to twice the Ante bet. Two extra community cards are then dealt, to give a total of five after which the dealer turns over the house’s two cards. Both the dealer’s and the player’s hands are to be scored in accordance with the highest cumulative poker value of the community cards and the two hole cards. To qualify for a win, the house/dealer must have either a pair of fours or better – if it does not, then the Ante pays as indicated in the Ante pay table while the Call bet pushes. The player loses both the Ante and Cal bets if the dealer has either a pair of fours or better, that is, the house qualifies and beats the player. 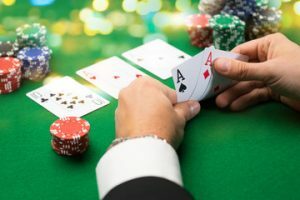 However, in case the dealer qualifies but is beaten by the player beats, then the player is entitled to an Ante payout paid out as outlined in the Ante pay table. The Call bet, on the other hand, pays 1 to 1. Both Ante bets and Call bets push in case the dealer and the player tie. As far as Progressive Jackpot side bet player payouts are concerned, only the final seven-card hand is considered regardless of whether the player loses to the dealer or decides to fold. As you can see, the rules of Live Casino Hold’em are pretty straightforward and very similar to those of Casino Texas Hold’em. The game is usually dealt from to a single shuffled 52-card deck with no jokers. Usually, two real dealers are usually assigned to a single Live Casino Hold’em table at all times. One real dealer is responsible for dealing the game while the other shuffles the other deck of cards to be used in the next deal. All players need to do to win is to beat the dealer’s hand – based on the usual hand ranks from Texas Hold’em poker. The most significant point of convergence between Live Casino Hold’em and Texas Hold’em lies in the strategic demands of both variants. To optimize your gameplay, it is important to decide correctly on whether to fold or to play after the first set of cards have been dealt. You will, therefore, need to give consideration to the strength of your hands as well as the possibilities of improvement of your hand once the remaining two cards have been dealt. It is advisable to always call if you have a pair or better, when you have an ace or a king and when you have a queen or jack unless the community cards are all of the same suit which you do not have. You should also call with a straight draw so long as only need a single card to complete a flush or straight. Folding is a great compromise in cases where you do not have any cards that match the board or when none over 10 unless you possess a flush draw or a straight draw. It is also very strategic to fold in case your hand consists of unpaired low cards that do not match the board and do not give you a flush or a straight draw.